The Conrad Schmitt Stidios completed the design, fabrication and installation of nineteen new stained glass windows for the Pope Saint John Paul Chapel at Mundelein Seminary in Mundelein, IL. 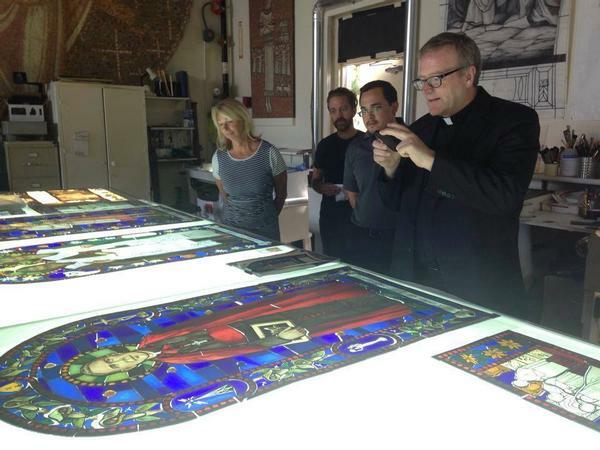 Working closely with Father Robert Barron and Dr. Denis McNamara to develop the designs, the windows depict saints of the Catholic Church, incorporating symbols and imagery significant to their lives. Fr. Barron envisioned the chapel to serve as an inspiration to generations of seminarians and a physical embodiment of the New Evangelization. This emphasis on spreading the Gospel through new media promulgated by John Paul II is a key philosophical movement within twenty-first century Catholiscism and a cause dear to Fr. Barron. The saints represented in the windows of the chapel were important intercessors for John Paul II, as well as influential evangelizers. Prayerful devotion and adoration of the Blessed Sacrament are also common elements in these saints’ lives. The saints are depicted as full figures, clothed in their recognizable vestmants but exuding the perfection of form attained in Heaven. They all stand on foliage, or the natural environment, emphasizing their origins on Earth and their roles as bridges between this world and Paradise. In addition to the narrative scenes depicted in the lower panels, the saints hold artifacts that help tell the stories of their lives. Each figure is bordered by personal emblems and symbols that help illustrate their attributes. The colors of the windows are reminiscent of medieval stained glass: deep blues, rich reds, and brilliant golds, all rendered in the finest mouth-blown glass. Through ecclesiastically appropriate artwork and design, Conrad Schmitt Studios is privileged to assist Mundelein Seminary in their mission to nurture seminarians in their calling to the priesthood.